Wiltshire Wedding photographers Jamie and Jackie McDine offer beautiful, natural, friendly and affordable wedding photography. This is your special day, so we take care to meet you before the big day, discuss ideas and produce beautiful images that you will treasure forever. 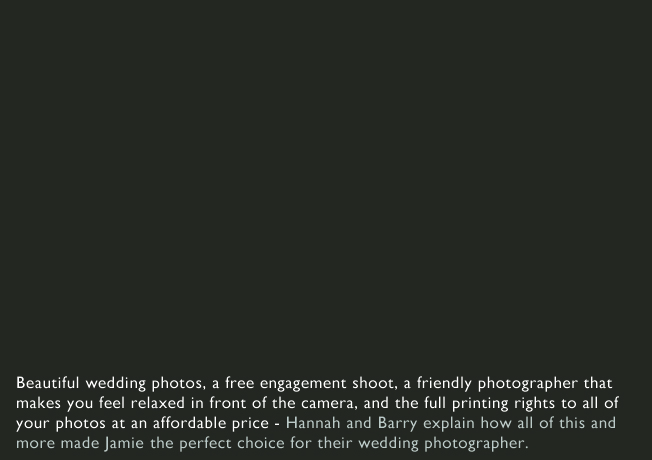 The perfect blend of beautiful posed couple shots, formal group shots, artistic details and natural shots of you and your guests enjoying the special day, and with prices starting from only £600 for 4 hours coverage, Jackie and Jamie are the perfect wedding photographer for you. We have over 250 weddings experience and also give you every single photo in the highest quality with full printing rights and a free engagement shoot! We'd love to hear from you and to talk about taking beautiful photos of your wedding day.